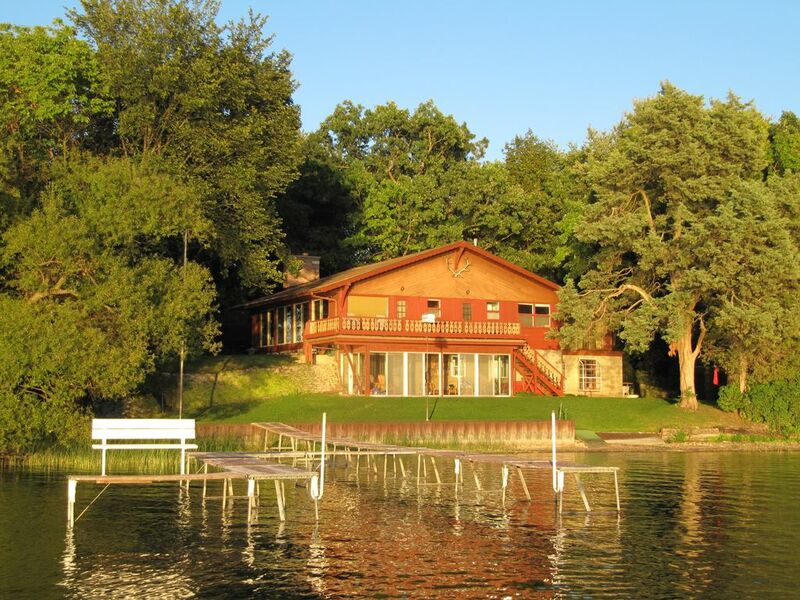 This two-story chalet style cottage sits right on the water of a small bay on Powers Lake, Wisconsin. Powers Lake is spring fed and very clean. Our lakefront is great for swimming.. a long shallow entry with a pebbly bottom. Lake views are on two sides of the property. Spectacular sunset views as well as star-filled night skies are featured from the front cedar deck which overlooks the lake. Our family has enjoyed many wonderful days in this pleasant home, which is situated on a quiet cul-de-sac. Families will be very comfortable with the open connected space of the great room, dining area, and kitchen. There is plenty more space to relax on the deck, in the screened porch, and recroom. A large grassy lawn offers a spot for outside games. • Great Room with 180-degree view of the lake throught the floor-to-ceiling windows along entire lakeside and knotty-pine paneling on walls. Fishing on Powers Lake is great — northern pike, bass, and pan fish! Many of the best catches have been made right off our pier. We love this comfortable cottage located on a lot with one of the best views of Powers Lake. Sunsets are remarkable and can be seen from the outside deck, great room, dining area, kitchen, and screened- in porch. Or sit on the bench at the end of the pier for a peaceful, sunset moment. That is when and where our son proposed to his wife! In many lakes, the lake bottom is mucky and thus unpleasant to walk in. The lake bottom at our property is pebbly and firm to the end of the pier (about 80-feet). This makes for a really nice swimming area for young children. shower, This is on the first level. 1 full bathroom is part of the main living area on the 2nd floor. 1/2 Bathroom and 2 showers/changing rooms are on the ground level. Our cottage sits right on Powers Lake. The lake at our property has a long shallow entry that gets deep very gradually so there is a large play/swimming area which is great for children! A great room is open to the dining room with the kitchen right there, too. Kitchen is well-equipped with coffee maker, blender, slow cooker, and plenty of cooking pots and baking pans. Canoe is available for renters' use. Located at the end of a quiet cul-de-sac. If you have a boat, bring it! If not, ski boats, pontoon boats, jet skis and kayaks can be rented from local businesses with delivery to Powers Lake. Owner may allow a dog for an additional fee. Please check with the owner for details. Fall/Spring/Early Summer rates are $500/night for Friday & Saturday; $400/night for other nights; $2200 for a week-long rental. Summer requires a 7 day rental Friday to Friday at a rate of $3800 for the week.